Attached is the photo of the mystery 'mile'post at Steeplehouse. The post appears on a photo of the line taken when Smart's (Steeplehouse) quarry was still in operation, so it isn't a post closure installation. The figures bear no relationship to any distance measurements that we know of and although it is sited very close to the Wirksworth/Cromford parish boundary it isn't exactly correct. In any case why mark this parish boundary rather than any other, as we are not aware of any similar markers anywhere else on the C&HP. If anyone can throw any light on the role of the post and what the figures stand for, we'd be delighted to hear an explanation. This must be a boundary marker of some sort. My guess is that it is the boundary between two gang areas for PW Maintenance, in this case the division between the areas of gang 81 and gang 82. Does anyone have a map, or a list, of the gang areas? 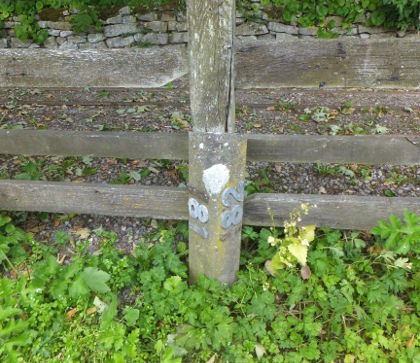 Richard Foster says that similar boundary posts have been seen on other lines. Such divisions were often painted on walls and fences in the BR period. Richard thinks that the concrete posts were made by the LMS rather than LNWR.